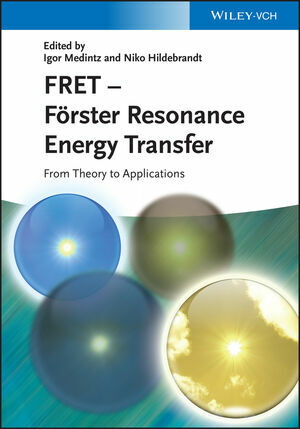 Meeting the need for an up-to-date and detailed primer on all aspects of the topic, this ready reference reflects the incredible expansion in the application of FRET and its derivative techniques over the past decade, especially in the biological sciences. This wide diversity is equally mirrored in the range of expert contributors. The book itself is clearly subdivided into four major sections. The first provides some background, theory, and key concepts, while the second section focuses on some common FRET techniques and applications, such as in vitro sensing and diagnostics, the determination of protein, peptide and other biological structures, as well as cellular biosensing with genetically encoded fluorescent indicators. The third section looks at recent developments, beginning with the use of fluorescent proteins, followed by a review of FRET usage with semiconductor quantum dots, along with an overview of multistep FRET. The text concludes with a detailed and greatly updated series of supporting tables on FRET pairs and Förster distances, together with some outlook and perspectives on FRET. for office and laboratory shelves. Dr. Igor L. Medintz obtained his B.S. and M.S in Forensic Science, followed by a Ph.D. degree in Molecular Biology in 1998 at the City University of New York. He carried out research as a postdoctoral fellow at the University of California Berkeley as well as at U.S. Naval Research Laboratory (NRL) in Washington, D.C. Since 2004, he has been a Research Biologist at NRL where he focuses on developing chemistries to interface nanomaterials with biology and understanding how nanoparticles engage in different types of energy transfer. Professor Niko Hildebrandt obtained a Diploma in Medical Physics in 2001 at the University of Applied Sciences Berlin and a Ph.D. degree in Physical Chemistry in 2007 at the University of Potsdam, where he also carried out postdoctoral research until 2008. From 2008 to 2010 he was head of the group NanoPolyPhotonics at the Fraunhofer Institute for Applied Polymer Research in Potsdam. Since 2010 he has been Full Professor at Université Paris-Sud, where he is leading the group of NanoBioPhotonics (www.nbp.ief.u-psud.fr) at the Institut d'Electronique Fondamentale with a research focus on time-resolved FRET spectroscopy and imaging for multiplexed nanobiosensing.